Lentils are considered to be one of the five healthiest food and are beneficial for people with heart disease, diabetes, and can significantly lower the risk of breast cancer. Lentils are a very inexpensive source for protein. Since lentils are high in fiber and low in fat, they can help to get rid of cholesterol and reduce blood cholesterol levels. 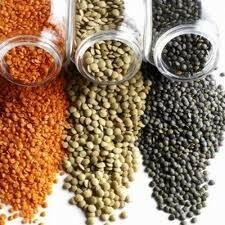 With the high levels of fiber in lentils they make it easier for the body to get rid of toxins. Lentils are also low in calories, so we do not have to worry about gaining excess weight. Lentils are an affordable, highly nutritious and easy-to-prepare legume. Rich in protein, iron, vitamins, fiber, folate, minerals and protective phytochemicals. Lentils are thought to be one of the five healthiest food and are beneficial for people with heart disease, diabetes and pre-diabetes. Lentils are an essential part of the everyday diet in many parts of the world, especially in West and South Asia and the Indian subcontinent which have a very large vegetarian population. Lentils are also a very popular source in the Mediterranean diet as well. Lentils are rich sources of protein, iron, folic acid, dietary fiber, vitamin C, and B, essential amino acids and trace minerals. 31 g dietary fiber, 60 g carbohydrates, 26 g protein, 7.5 mg iron, 479 mg of folate, 0.87 mg thiamine and 1 g fat. Lentils have a high concentration of antioxidants as well. Lentils vary in size and in colors. The range from black and brown, green, red-orange and yellow. A diet high in legumes can significantly lower the risk of breast cancer. This has to do with the high levels of flavones that are to be found in legumes. Breast cancer is one of the most common forms of cancer today, and are the reason for a large number of fatalities all over the world. So why not include legumes in your diet as a cancer preventive method. Lentils are a good source of fibers to help in weight loss programs. Fibers makes us feel full and that makes us eat less when we include lentils in our diet. Lentils are also low in calories, so we do not have to worry about gaining excess weight. This is a cheap and easy recipe for families on a budget and even meat-eaters will find this dish to be healthy and delicious veggie option. This loaf has minimal hands-on prep time, but you can even cook the lentils ahead of time to make assembly faster. Serve with mashed potatoes or rice. 1. Rinse the dried lentils. Bring water to a boil. Add lentils and simmer 25 - 30 minutes, until lentils are soft. Drain any excess water. 2. Preheat oven to 400 degrees F (205 degrees C). 3. Add 1 tablespoon of the olive oil to a skillet on medium heat, add chopped onions, pressed garlic, red and green bell pepper and let cook until onions are transparent (about 5 minutes), stirring frequently. 4. In a mixing bowl combine, cooked onions, garlic and peppers, cooked lentils, bread crumbs, chopped nuts, soy sauce, 2 tablespoon olive oil, grated cheese, cumin, oregano, salt, pepper and mix until well combined. 5. Spoon into loaf pan that has been generously sprayed with non-stick spray. Serve with mashed potatoes or rice with a nice salad. This Greek soup "Fakes (pronounced 'Fah-kehs') are a healthy and delicious veggie option. Made from just a few inexpensive ingredients, this is a great way to stretch your budget. In a large soup pot add water, tomatoes, lentils, onion, garlic, bay leaves, salt and pepper and olive oil. Bring to a boil over medium heat. Reduce the heat and simmer covered for 40 minutes to 1 hour, or until lentils are done. Stir once in a while. Remove from the heat, take out the bay leaves. Stir in the oregano and vinegar. Add some more salt and pepper to your taste. Stir the flaxseed and water together until it is creamy. Put the flaxseed mixture, onion, garlic, carrot, cheese, breadcrumbs, tomato sauce, cumin, salt, pepper, chilli pepper, oregano and bean and lentils in a food processor/blender and blend until smooth. Heat some oil in a pan on medium heat. Spoon out a ball of mixture in your hands. Make patties. Place them in the pan. Leave it for a minute then flip the ball (this ensures you have one side that's cooked enough to be prodded without sticking). Flatten with a spatula making sure the spatula is clean so the mix doesn't stick to it. Turn the heat down to low. This is important because you want the heat to cook through the patty, which takes a while, without burning the outside. Leave for about 5 minutes and then flip again. Leave for another few minutes. Repeat for the other patties, just make sure you turn the heat up before each batch so the first side cooks a little quicker than the second side). In a large pot over medium heat add the olive oil, onion, and shallots. When the onions soften up and get a bit translucent, add the garlic, ginger, chili powder and cumin. Stir well and cook for a minute of so, until everything gets quite fragrant. Stir in the serrano pepper and chipotle pepper, tomatoes, and 5 cups of the broth. Add the lentils. Bring to a boil, then reduce the heat to low and simmer. Simmer for about 35- 45 minutes or until the lentils are cooked through. You will likely need to add the rest of the water, a cup at a time, if the chili thickens up too much. Before serving do add more chipotle, salt, or whatever you think it needs. Serve with these toppings (opt): A bit of feta or grated cheese of your choice. A bit of chopped serranos, yogurt, oregano, chopped onion, green lettuce, sliced tomatoes and olives. 2 teaspoon olive oil • 1/2 cup chopped onion • 1 cup fresh sliced mushrooms • 1 red bell pepper • 1 green bell pepper • 1 cloves garlic, minced • 1, 5 cup cooked lentils • 1 (8 ounce) can tomato sauce • 1/2 (6 ounce) can tomato paste • 1/2 cup of water • 1 bouillon cube, chicken or beef • salt and black pepper to taste • 1 teaspoon oregano • Grated cheese of your choice. Cook the lentils ahead of time to make assembly faster. Add 1 tablespoon of the olive oil to a skillet on medium heat, add chopped onions, pressed garlic, red and green bell pepper, sliced mushrooms and let cook until onions are transparent (about 5 minutes), stirring frequently. Stir in tomato sauce, tomato paste, water, 1 bouillon cube, lentils, salt, black pepper and oregano. Cover, and simmer for 20 minutes. If necessary, add more water to keep the sauce from sticking. Be careful not to dilute; the sauce should be quite thick. Serve to any pasta of your choice and top with grated cheese. Legumes containes enzymes that offer protection against the damage caused by cells by free radicals, which can lead to cancer, so try to incorporate legumes into your daily diet. Adding cooked lentils to any salad will make the salad even more healthful and delicious. Now you evoking memories! In my childhood my mother used lentils a great deal. She often mixed them with barley, which she also liked, added some mutton chops, peas and carrots and then made a tasty stew. A wonderful way to cheaply feed a working class family when money was scarce. Recently, I have been using soup made from my allotment vegetables. My wife, who insists that making it is her exclusive preserve, finds that adding lentils gives body to the soup. However, I did not know that there were so many varieties of lentils. I enjoy a good pot of lentils. I must confess I have never tried all the different varieties, but I'm sure I'd love them all. The lentil loaf looks yummy! Sharing this via Pinterest. Lentil chili sounds like it would hit the spot. Thanks! Had no idea that lentil burgers actually exist! Great post, Sennel! I pretty much enjoyed it! Cheers! Your recipes look delicious! I'll have to try some of them. Hello Rose! Lentils are just perfect for Indian dhai's. I make it all the time. I love the combination of turmeric and lentils. There's lots of Indian dhal's you can make with lentils too. I always keep a jar of lentils handy in case I haven't got time to shop and need to make dinner in a hurry. Thank you Audrey! I'm happy you enjoyed it. The lentil loaf looks delicious!! Great article!